As many as 60,000 students in 49 government-aided schools run in the district had to sit at home today following a protest by their teachers against the alleged misbehaviour of a complainant during a vigilance raid on S.D. Jain Senior Secondary Girls School on Tuesday. On a call given by the Punjab State Government-Aided School Teachers' Union, as many as 2,000 teachers remained on strike today, forcing the closure of 49 schools. Some teachers sat on dharna outside the Division number III police station and demanded immediate action against some ‘‘intruders’’ who misbehaved with women teachers during the raid. The Principals of these schools organised an emergency meeting in the afternoon to decide the future course of action. The Principals said if a case was registered against the' trespassers' they would re-open the schools tomorrow. The local Vigilance Bureau had conducted a raid on the school premises on Tuesday after a complaint was received by it stating that the school was misusing government funds. The teachers were all set to take out a march in the rain to impress upon the local police to register a case against some persons who had allegedly entered the school premises along with Vigilance sleuths and misbehaved with the teachers and even used foul language . But on the intervention of the police officials, the march was postponed till tomorrow. Ms Asha Chopra, principal of the school, alleged that these persons had torn and even stolen some school files. She said that while it was being alleged that the schoolteachers had smuggled out some records from the school during the raid, these were actually being taken out for getting these Xeroxed. She further alleged that some persons had manhandled certain teachers and even destroyed records in the process. Mr Teja Singh, President of Government Aided Principals Union, said they wanted to reopen the schools as soon as possible. But if the police failed to take action, they would be forced to observe an indefinite strike. Ms Chopra said that the accused, a complainant in the case, had complained to the Vigilance to ‘‘settle an old score’’ with the schoolteachers. She alleged that he had pressurised and even threatened the management of the school to appoint some teacher in the school. She said the management appointed teachers only on merit annoyed, the complainant approached the Vigilance against him. She said that she had nothing against the Vigilance sleuths as they had behaved well with the staff, but 25 persons had entered the school forcibly during the raid and misbehaved with women teachers .she demanded immediate action against these 25 persons, including the complainant. The police had not registered any case against anybody. Meanwhile, the Ludhiana Sewa Sangh has demanded action against the managements of 49 schools for keeping the schools closed and causing a loss to thousands of students in the district. Dead man booked for harassment ! In an unusual case, the Division No 7 police (Vardhman police station) has booked a dead man in a dowry harassment case lodged by his daughter-in-law, who is a resident of Mahima Singh Wala village in this district. The man, Gurchetan Singh Dhaliwal, an NRI who died over 12 years ago at London in the UK, was booked along with his NRI son Jaskaran Singh, wife Gurmail Kaur and three other relatives for allegedly harassing the complainant, Navjot Kaur, married to Jaskaran Singh on April 20, 2002, at Veer palace, here. But Gurchetan Singh had died on August 23,1990, in London. A copy of his death certificate issued by the Birth and Death Registration authority, Redbridge , which was procured by Ludhiana Tribune, confirms the death. The cause of death was heart disease. the family of the accused said they would contest the charges. The complaint even states that gold jewellery was given to the ‘dead’ man. Sources in the Vardhman police station ,when contacted ,expressed surprise at the registration of the case. They, however, said it could be just f a ‘clerical’ error. They added that discrepancies would be removed after the investigation was completed. Family sources refused to buy this explanation. They said one of their elders were defamed. They demanded registration of a counter- case against the complainant family. The other relatives booked in the case were Sarban Singh, Shinder Singh and his daughter Gaggan., all relatives of the accused NRIs. A Nambardar of a village in Goraya sub-division of Jalandhar district was also booked as party to the crime. The complainant, Navjot Kaur, was married to Jaskaran Singh at a glittering ceremony in April last year. According to the FIR, Rs 10 lakh in cash apart from jewellery were allegedly paid to the accused NRI family. The harassment for dowry allegedly began immediately after the marriage. The FIR states that her husband made a demand for an expensive car from her parents. To observe martyrdom day of the Father of the nation, as ‘Shaheedi Divas’, a function was organised at Mini Secretariat here today and glowing tributes were paid to Mahatma Gandhi and other martyrs of the country. The participants observed a two-minute silence on the occasion. Mr Anurag Agarwal, Deputy Commissioner, Ludhiana, presided over the function. A contingent of the Punjab Police saluted the National Flag by reversing arms as a mark of respect to the martyrs of the country. Mr Agarwal said the nation would always remember the sacrifices made by Mahatma Gandhi and other martyrs of the country. He said Mahatma Gandhi led a unique non-violent movement to bring freedom to the nation. He said strengthening the unity, integrity of the country would be the real tribute to Mahatma Gandhi and other martyrs. Among others who attended the function were Mr Rahul Bhandari, Additional Deputy Commissioner (General), Mr Sumer Singh Gurjjar Additional Deputy Commissioner (Development), Mr M.S. Jaggi Assistant Commissioner (General), Ms Bhawana Garg, SDM (East), Mr Ajoy Sharma SDM (West), Mr A.K. Sharma, Deputy Director (Small Savings), Mr M.S. Kelley, DRO, Mr M.S. Grewal, DDPO, and Mr Bachhiter Singh, DEO. Tributes were paid to the Mahatma also at a function organised by the District Congress Committee at Congress Bhavan here. Party activists offered flowers at the portrait of Mahatma Gandhi and recalled his contribution to the freedom struggle. Mr Malkiat Singh Dakha, MLA, urged people to follow in the footsteps of the Mahatma and abide by his ideals. Mr Dewan Jagdish Chander, president of the All-India Freedom Fighters Association, paying homage to the Mahatma, recalled Civil Disobedience and Non-Cooperation movements launched by the great leader. Mr Krishan Kumar Bawa, DCC (U) President, maintained that the Congress was committed to follow the principles of equality and a casteless society. Among others present at the function were Mr Pawan Diwan, vice-president of the Punjab Youth Congress, Mr Parminder Mehta, president of the District Youth Congress, and Dr Parshottam Lal, and Mr Chanchal Singh, councillors. Punjab Youth Congress activists also paid tributes at a function held at Abdullapur Basti. Speaking at the occasion, Mr Diwan said it was due to the sacrifices made by the Mahatma and thousands others that people were enjoying freedom. The Friends Ekta Club observed Martyrdom Day of the Mahatma as “balidan divas” at a function at the Kot Mangal Singh locality. Mr Rajesh Mishra, Chairman of the club, focussed on the life and achievements of the Mahatma. Mr Shiv Malhotra, president of the club, urged the people to follow the ideals of the Mahatma. The District Youth Congress (Urban) and the Congress Sewa Dal paid tributes to the Mahatma at functions organised at New Vishnu Puri and Baba Deep Singh Nagar. Fatehgarh Sahib: A two-minute silence was observed on the Martyrdom Day at the administrative complex here today. Mr Vikas Partap, Deputy Commissioner, Mr Utpal Joshi, SP, Mr V.K.Ohri, ADC, Mr Navjotpal Singh Randhawa Assistant Commissioner (General) and other district officials and employees took oath to follow the path of peace and non-violence shown by Gandhiji. Accountability has hit the teaching fraternity of Punjab Agricultural University (PAU) hard following the ongoing in-house review of research, teaching and extension programmes in different departments of the constituent colleges of the university. The elaborate exercise will be carried out under the chairmanship of the Vice-Chancellor, Dr Kirpal Singh Aulakh. He has drawn up an elaborate schedule and will review all programmes, whether funded by the government or the Indian Council of Agricultural Research (ICAR). According to sources, the move is the first of its kind. While the progress on programmes and schemes was reviewed by the Board of Management of the university, it is for the first time that such an extensive exercise has been initiated by the Vice-Chancellor. The programmes of the Departments of Animal Breeding and Genetics and the Livestock Production and Management were the first to be reviewed on January 28. The Vice-Chancellor reached the department concerned and reviewed the report put up by the respective heads of the department. The research achievements during the past year were looked into followed by presentations by scheme in charge, the sources said. The in charge had been directed to spell out in detail the progress made in the respective sections by each scientist working in that section/group of the department. The teaching and extension education activities of scientists might also be brought out. Only the salient achievements were expected to be presented and all were requested to make use of multimedia facilities. The heads of the departments had also been directed to ensure the participation of the scientist concerned in other departments where discussion were expected in fields related to their areas of research, the sources pointed out. Dr A.S. Joshi, president of PAUTA, said it was a routine exercise and the association was keeping track of the developments but would resist any action initiated against any member. The Bharatiya Janata Yuva Morcha (BJYM) today claimed that after sweeping the Assembly elections in Gujarat, the BJP was all set to repeat its performance in the ensuing elections in Himachal Pradesh. Mr Sukhminder Pal Singh Grewal, former state president and member of the BJYM national executive, said in a statement here today that the electorate was aware of the misdemeanours of certain Punjab ministers during their tour of Gujarat and Panchkula episode involving a senior bureaucrat. He said the BJP would focus on the development of Himachal Pradesh under its regime. Mr Grewal criticised SAD (A) President Simranjit Singh Mann for the allocation of Rs 1 lakh out of his constituency development fund for setting up a library in the name of Mohammed Ali Jinnah. Opposing a memorial to Jinnah, he said Mr Mann should have provided funds from his own resources for this purpose. He said he would soon lead a deputation to meet the President seeking a statutory framework which should govern the fund allotment by MPs from their discretionary quota. The continued spell of rain over the past few days has boosted the prospects of rabi making the local farmers and agriculturists euphoric. Farmers had been worried due to the prolonged cold weather that was threatening to damage the crop in some areas. The mild rain has raised their hopes of a good yield. Mr Malkit Singh, a farmer of Ghungrana village, near here, said “The fog did not cause much damage to the standing crop but we have been apprehensive of the frost that has begun to set in. But with the weather opening up and mild showers, the crop outcome is expected to be very favourable”. The district has a substantial share in the 35.5 lakh hectares of wheat in the state. Besides wheat, the mustard crop in the district is also expected to be much higher in yield as compared to last year as expected by experts at Punjab Agricultural University PAU. Congressmen of Ludhiana continue to be at loggerheads and new alignments are taking place. There is a vertical division among leaders and infighting has become intense. Ludhiana district has 12 Vidhan Sabha segments and during the 2002 Vidhan Sabha elections, the Congress won nine seats, including four in urban segments. In the new alignments, one group is headed by Mr Gurcharan Singh Galib, Lok Sabha member, and includes Mr Surinder Dawar, MLA (Ludhiana East), Mr K.K. Bawa, DCC(U) President, Mr Gurdev Singh Lapran, DCC (R) President, and Mr Malkiat Singh Dakha, MLA from Dakha. The other group which has emerged on the scene comprises Mr Harnam Das Johar, MLA (Ludhiana West ), Mr Malkiat Singh Birmi, MLA(Ludhiana Rural), Mr Darshan Singh Brar , former Minister, Mr Ishar Singh , former Minister, and Mr Jagjit Singh Lambran. The latter group comprising Mr Johar and Mr Birmi has demanded the removal of Mr Bawa and Mr Lapran from the presidentship of the DCC (Urban and Rural) for their alleged failure to build up the party image and carry workers with them. The Johar-Birmi group has further alleged that the two leaders do not have any mass base. The PPCC had organised the Republic Day function at Ludhiana where Mr H.S. Hanspal, the PPCC President, was the chief guest. MLAs and other leaders were asked to participate in the official function but some of them did not. Now the DCC(Urban and Rural ) have recommended to the (PPCC) that action should be taken against Mr Johar and Mr Birmi for not participating in the Republic Day celebrations. The two leaders maintain they had organised separate functions as in the past, adding that they have not violated party discipline. Congress leaders here have their own scores to settle, claiming to be senior to one another. Mr Johar had a tiff with Mr Galib at the time of the Punjab Pradesh Congress conference here two years ago when Mr Johar was not allowed to speak. Similarly, Mr Darshan Singh Brar was a ticket aspirant from the Jagraon Vidhan Sabha constituency and was opposed by Mr Galib and was denied ticket. Mr Brar contested as an Independent candidate and the official nominee of the Congress lost with the result the seat was won by the SAD candidate. The demand for the removal of Mr Bawa and Mr Lapran from the presidentship of the DCC (Urban and Rural ) cannot be met by Mr Hanspal as both were nominated by Capt Amarinder Singh during his tenure as PPCC President notwithstanding the fact that they have very little contribution to their credit in strengthening the organisation. Mr Hanspal will have to have the take of Capt Amarinder Singh for making new appointments. Mr Lapran had once deserted the Congress and joined the SAD after the assassination of Beant Singh. Mr Tej Parkash Singh, son of the late Beant Singh, is keeping himself aloof from the tug of war between the two groups. Mr Amrik Singh Dhillon, Samrala MLA, has a grouse against Mr Galib as with the efforts of the latter Mr Lapran was able to become the DCC (R) president by removing Mr Harmohinder Singh Pradhan, former MLA from Raikot who is a close associate of Mr Dhillon. Mr Hanspal is under pressure to reorganise the District Congress Committees. But he has not initiated any step in this regard. A meeting of Ludhiana-based journalists representing various newspaper organisations today unanimously condemned the impounding of the vehicle of a scribe who had gone to cover the meeting of the Shiromani Akali Dal (Badal) at Gurdwara Manji Sahib at Alamgir, near here, yesterday. Three other scribes, a photographer and two reporters belonging to vernacular newspapers and a national news agency, were also harassed as they were travelling in the same car. Only yesterday, the police lifted the vehicle of a scribe of Indian Express newspaper, which was parked in the parking area along with several other vehicles. Intriguingly, the police personnel deployed there selectively picked up the particular vehicle belonging to the scribe although they did not prevent them from parking the vehicle there. The meeting was attended by the representatives of all the newspapers who condemned the attitude of the police and described it as a deliberate attempt by the local police to harass the scribes and gag the media. They pointed out it was not for the first time that such an incident had taken place. They condemned the attitude of the district police that took three hours to release the vehicle despite the intervention of the former Chief Minister, Mr Parkash Singh Badal, former Finance Minister, Capt Kanwaljit Singh, the Press Adviser to the Chief Minister, Mr Bharat Inder Singh Chahal and the IG police, Mr SK Sharma. Mr Badal and Capt Kanwaljit had also condemned the incident while Mr Sharma had described it as a “nonsense”. The scribes listed several incidents during the tenure of the incumbent SSP, Mr Harpreet Sidhu, intimidating journalists in various cases besides physically manhandling them. They pointed out even during his earlier tenures at Patiala and Fatehgarh Sahib, he had victimised journalists there. The scribes warned that in case such bullying attitude of the police continued, they would be forced to adopt agitational path. They also decided to meet the Chief Minister, Capt Amarinder Singh, and the Director General of Police, Mr MS Bhullar. They said, they had no confidence in the local police which could go to any extent even registering false cases against journalists as it had done earlier also. He is the proud father of a son who laid down his life fighting for the honour of the country. Even 31 years after Flying Officer Nirmaljit Singh Sekhon sacrificed his life, a void remains unfilled in the life of his father, Mr Tarlochan Singh Sekhon, who is spending his twilight years in this village. Although hard of hearing, this 79-year-old man, who lost his vision after a paralytic attack a few years ago, is proud that he has given a son to this land who fought for it and preferred death to defeat. While the brother of Nirmaljit Singh says that his father is quite happy at the honours bestowed on him due to the sacrifice of his son, but an itch always remains that the administration never bothered about him, although he had been living in the village for the past many years. Mr Sukhminder Singh Sekhon, Nirmal’s younger brother, says the Air Force officials from Halwara kept on visiting his ailing father all these years and even arranged for a full-time servant for him. Even the doctors from the Halwara Air Force Hospital visited him every fortnight or month and collected blood samples and prescribed him medicines. ‘‘But nobody from the civil administration has ever visited to see the man who gave away his son to the country whose brave acts were acknowledged by the Government of India and he was even decorated with the highest gallantry honour of the forces — the Paramvir Chakra,’’ he adds. Recalling the days when the 1971 war was underway, Mr Sukhminder Singh says it was a moment of grief for the family when it received the news of Nirmal’s attaining martyrdom. ‘‘We received a telegram on December 15, 1971, at around 3 pm stating that he had laid down his life while fighting the enemy. My parents, especially my mother, were very upset at his death. But when we received the details of his attaining martyrdom, we felt proud that Nirmal was related to us. He had set an example of supreme valour. Then we received his ashes after some days,’’ he says. Then on January 12, 1972, it was declared that he would be awarded Paramvir Chakra posthumously and on January 26, 1972, his parents were given the award at the Red Fort, New Delhi. ‘‘Today we are proud of him. Even the residents of this village have never forgotten him and they make sure to commemorate his martyrdom day every year,’’ he says. The government has extended various grants from time to time for the development of the village, which was to be developed as an ‘adarsh’ village. The ongoing agitation of class IV government employees in this district intensified further with two employees sitting on an indefinite fast here on Wednesday. Talking to mediapersons here today Mr Hari Chand, district president of the employees’ union, said earlier rallies were held in front of ‘tehsil’ headquarters of Sirhind, Bassi Pathana and Mandi Gobindgarh to draw attention of the government towards their demands. Their demands included regularisation of the services of part-time employees and to revoke the policy of privatisation in municipal councils, PWD, Food and Civil Supplies and other departments. A few days ago Chaudhary, Jagjeet Singh, Minister, Local Government, Punjab, had assured a delegation of union’s state committee, led by its secretary-general Sajjan Singh, that their demands would be discussed on the return of the Director, Local Government, Punjab, but no progress had been made so far. With no immediate solution insight, the union decided to intensify the agitation further. Mr Kashmiri Lal, president of sub-committee of the union, and Mr Rajinder Kumar sat on an indefinite fast in front of the municipal gate Mandi Gobindgarh, yesterday. A rally was also held on the occasion. It was addressed by Mr Shiv Dut, Mr Hansa Singh, Mr Somnath, Mr Mohan Lal, Mr Barinder Baini and Mr Baltej Singh. The SAD general secretary and MP, Mr Sukhbir Singh Badal, was today honoured by activists of the Dakha circle of the Youth Akali Dal and area residents at Rhythm Palace here this afternoon. The function was organised by the Circle in charge, Mr Darshan Singh Shivalik, and general secretary of the state unit, Mr Manpreet Singh Grewal. Talking to mediapersons, Mr Badal said the Congress was trying to cover up its misrule by implicating SAD workers and leaders in false cases. Condemning the arrest of former minister Sohan Singh Thandal, he said the property owned by the minister was only average. “He has been arrested with an intention to divert the attention of the people from various scandals,” he alleged. “The people are fed up with misgovernance and lack of development and have no option, but to come out on the roads. The ‘rasta roko’ stir was the third attack on the regime,” he asserted. On the recent statements of Sikhs being keshdhari Hindus by the RSS, he said the SGPC was the competent authority to answer these questions and to take cognisance of the issue. Prominent among those on the occasion were Mr A.S. Aliwal, former MP, Mr A.S. Mallah, Mr G.S. Sangowal, Ms Harbans Kaur Sukhana, members SGPC, Mr Jagjit Singh Dhandra and Mr Satinder Singh Bhanorh. Representatives of Government Rented Colony Welfare Association, Dugri, today met the Deputy Commissioner and handed over a memorandum to him demanding that the flats in the colony should be allotted to them on a permanent basis. They claimed that the flats, which were constructed by PUDA, were in the illegal possession of some police officials who were not paying any money to the renting authority. They claimed that there were around 804 flats in the colony, 552 of which were allotted to employees and the rest were lying vacant since 1996. The employees were paying Rs 70 lakh to the state exchequer as rent. Stating that around 65 persons were staying in some flats by occupying them illegally, the representatives said they were using electricity and water and not paying anything for them. The local State Bank of India Ladies Club, today presented a steel almirah to School for Deaf and Dumb, Rajpura Road, Ludhiana, and distributed packets of dry fruits to children. The club, comprising the wives of senior officers of the State Bank of India, posted at Ludhiana, has been undertaking various social welfare activities from time to time. Ms Suversha Kalra, secretary of the school, lauded the concern of the club for handicapped children and apprised the club members of the progress of the school. The school follows Punjab School Education Board syllabus and specially trained teachers impart education to about 200 children. Ms Mohini Saran, president of the club, appreciated the management of the school and dedication and concern shown by the teachers in imparting knowledge to the handicapped children. Mr Inderjit Chopra, founder president of the school, thanked the club members. The People For Animals (PFA), Ludhiana, announced its new list of office-bearers here yesterday. Dr Sandeep Jain, president of the association, in a press statement said Mr Anurag Aggarwal would be the chief patron. The patrons include Mr K.Shiva Prasad, Ch Satya Prakash, Mr Ram Kumar Jain, Mr T.R. 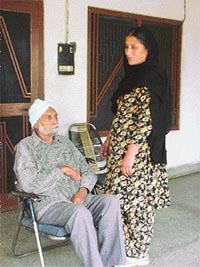 Jain and Mr Narpal Singh. The advisory board includes Mr Radhey Sham Gupta, Mr Rakesh Jain, Dr B.S. Gill, Mr Gurcharanjit Singh, Mr Sikandar Lal Jain, Mr Ashok Shital, Dr Ashok Kumar and Mr Prem Sagar. The vice-presidents would be Ms Anupama Jain and Mr A.P.S. Gogia. Mr Ajay Jain would be the general secretary and Mr Rajiv Bhandari would be the office secretary. Three truck drivers were booked under Section 279 of the IPC for blocking traffic and creating nuisance for passers-by at Sahnewal chowk on Thursday. Sukhdev Singh, driver of truck number PB-10-S-9903, Satinder Singh, driver of truck number JK-02-5143, and Ram Krishan, driver of truck number PB-5-9115, were arrested by the Sahnewal police for wrongly parking their vehicles at the main chowk of Sahnewal and disturbing the flow of the traffic on the GT road. Fraud alleged: Ram Das has alleged that Satish Kumar, Arun Kumar, Ramesh Kumar and Prem Kumar of Thapar Agro Mills Limited have defrauded him. A case has been registered under Sections 420, 294, 341, 506 and 120-B of the IPC. A joint action committee of various trade and industrial associations today demanded the withdrawal of exim form that has been made compulsory by the government for all registered dealers with effect from January 13. The form, to be issued by the sales tax authorities, will have to be sent with all consignments worth over Rs 10,000. The action committee warned that in case the government did not withdraw the form by February 3, it would organise a protest rally on February 4 at Vishwakarma Chowk, near Gill Road. The members of the action committee, while addressing a joint press conference here today said, the form would only lead to harassment of traders and the industrialists and would in no way increase the revenue. The committee was constituted yesterday taking members from various trade and industrial associations. They include Mr Inderjit Pradhan, Mr Amrit Lal Jain, Mr D.S. Chawla, Mr P.D. Sharma, Mr Ashok Juneja, Mr Vinod Thapar, Mr Jagmohan Sharma, Mr V.P. Chopra, Baba Ajit Singh, Mr Sunil Mehra, Mr K.K. Seth, Mr Balwant Rai, Mr Parveen Gupta and Mr Joginer Kumar. Besides, all presidents and general secretaries of various trade and industrial associations will be the associate members of the committee. Members of the action committee members said, “The form is not desired and will not increase government revenue as entries of all goods exported or imported from Punjab are already collected by the Sales Tax Department at information collection centres.” Besides, they said, it would be difficult to get these forms from the Sales Tax Department as most of the times the department runs out of stock of various forms. It would hamper the smooth flow of business since certain parts of machinery and other items and goods were generally required urgently and these were usually dispatched by the suppliers after receiving the order on fax or telephone only. They questioned the logic of introducing the form right now as the VAT was coming into force from April 1. They said, the form had been introduced without taking the trade and industry into confidence, although senior officials and politicians, including the Patiala MP, Ms Preneet Kaur, had assured that trade and industry would be taken into confidence before taking any such decision.